Here’s a pro tip … 30 minutes from the Las Vegas strip, one can find trails that will make you grin from ear-to-ear. I was having a great ride until I wasn’t. Ideally, that pedal pictured above is one – not three pieces of medal. And it was until striking a boulder dead-on … at speed. Conveniently, my ride was mostly completed and the what remained was downhill. Fortunately, there was a bike shop ten minutes from the trailhead. Unfortunately, the replacement pedals set me back $150. On he bright side – the new pedals are black and look a whole lot better on my bike. In a move that can only be described as being highly uncharacteristic, last week Kelly and I made a snap decision to leave the soothing vast emptiness of Death Valley National Park and visit its evil twin – Las Vegas – for a few days. We made the decision knowing that during the stay I would have a chance to meet-up with former colleagues attending a conference while also making time to visit family. Coupled with a few other to-do’s while in the area, these “up-sides” became justifications Kel and I anchored to as we ventured into the city known for showcasing much of the urban trappings we otherwise loath. And yes … we did spend an evening on the strip dining and walking – not gambling – through casinos. Valley of Fire State Park is located about an hour from the glitz and glamour of the Las Vegas strip, but scenically the park may as well sit atop another planet. This being our second visit to VOF we knew what to expect. The park is not particiually large and ambitious hikers can easily traverse most of the trails in two or three days. As an escape from the Vegas circus this place is just about perfect … even more so if you camp in the (cheaper) non-hook-up sites. Today Kelly and I are traveling with two other couples to Death Valley. But first, we stopped at a Las Vegas BassProShop parking lot (next to a casino obviously) to regroup while Kelly visits a nearby hair salon and our buddy awaits his wife to fly into town. Tonight, we sleep in the desert. Home from Lake Mead for a full week, I’m inexcusably late in this post … which at this point seems excessively post factum. Nevertheless, I feel a sense of obligation to draft some thoughts, if nothing else, to keep my mom abreast of our holiday travels to the desert. As mentioned in my last post, Kelly and I ventured to Lake Mead Recreation Area chiefly to spend the holiday week in the Las Vegas desert with a few of our Airstreaming pals. The front half of the week, while not particularly eventful, was great. Working remotely, just like working from my allegedly hip Silicon Valley office, is still a drab corporate gig, but the change of scenery and evening meals chatting with our well-traveled friends made for a welcome change of pace. Thanksgiving Day morning Kelly and I took a hike along the historic Railroad Tunnel Trail. Built in 1931 for the purpose of transporting materials and equipment necessary to construct the Hoover Dam, today the trail is frequented mostly for recreation purposes (and on this day a Turkey Trot 5k & 8 mile race). Thanksgiving dinner was hosted in proper fashion at a decidedly welcoming home, complete with all the usual fixings. More, as there were three vegans in the house, the menu offerings had been interestingly expanded to accommodate the plant based eaters amongst us. Suffice it to say, the meal and all-around good company made for a fantastic gathering. Also, as evidenced within this photo, I had an opportunity to display swordsman-like carving skills. In dire need to shed our gluttonous post T-Day meal fog, our desert gang went for a hike through a maze of slot canyons not too far our campgrounds. Sufficiently in the middle of nowhere, and mostly accessible with high-clearance vehicles (less one overly ambitious Prius driver), these were spectacular hiking grounds, and nowhere I would want to find myself in need of a quick ambulance rescue. Before we knew it, a few days accumulated themselves into a full week and sadly, it was time to leave this wonderful place and our good company behind. Fortunately, our retreat to HMB is limited. 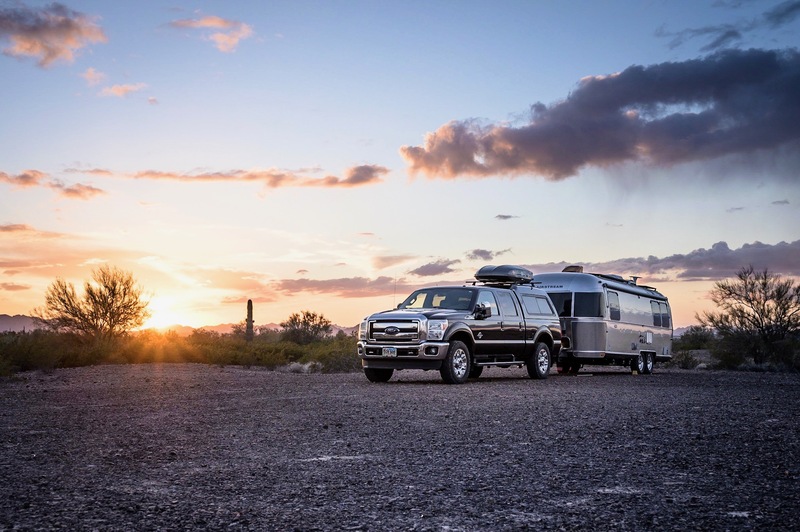 In two weeks we’ll hitch the Airstream and once again travel to the lovely southwest desert – this time our destination being Arizona. Celebrating Christmas with Kelly’s family and rolling into 2014 someplace not yet determined, she and I will undoubtedly be contemplating how is it that another year has passed so quickly. Yesterday Kelly and I arrived to Lake Mead National Recreation Area, and once again we find ourselves visiting a national park. It appears that our woes with the recent government shutdown are now a fading memory, as this time, we were welcomed to these government lands with open arms. Our good pals and fellow Airstreaming couples Tim & Amanda and Brian & Leigh who live, work, and travel full-time in their respective homes on wheels are also here. Seeking warmer winter temperatures found closer to the 35th latitude this time of year, both couples have retreated to the desert southwest for the winter and graciously invited Kelly and me down for the week to join them. Despite our location being essentially in the middle of nowhere, Lake Mead offers its visitors an incredibly hospitable desert camping experience. With its relatively close proximity to the other city that never sleeps, this location affords us certain ‘roughing-it’ luxuries such as super fast broadband internet, a handful of over-the-air digital HD television channels, and as of mid-day today, clear ocean-blue skies to warm the air and pump plenty of sun-rays into our solar panels. The invite definitely seemed like a good opportunity to spend a few days working remotely before enjoying the long Thanksgiving weekend with friends. Suffice it to say, we quickly accepted. A bit tired from the long drive and with rain in the air, we mostly hung out yesterday, but today took advantage of the great weather with a few hours of hiking followed by an potluck dinner at our trailer. We love hanging-out with these guys and are looking forward to a very promising, food-filled, few days. Following our failed visit to Zion National Park in Utah, Kelly and I headed west into Nevada – our destination being Valley of Fire State Park. A few months ago I was channel surfing and stumbled upon a TV show showcasing the park. At the time, I didn’t think much about it other than to make a mental note that one day our visiting the park might make for a nice side trip. Well, as things turned out, Kelly and I found ourselves in the neighborhood with a few extra days to kill before heading back to HMB. This being the case we decided to re-watch that Valley of Fire TV episode (click here to view) in order to refresh our memories of the park’s offerings and then decide whether or not to visit. Rather quickly we agreed to check it out. Overall the park is awesome and I’m really glad we stopped there. Only 40 miles from the Vegas strip (easy interstate driving), this park is clearly a hidden jewel. Any visit to Vegas should include a dash of sanity that this park can readily provide. Rather than sip drinks at some cheesy poolside hotel bar all day, I’d suggest venturing over for a day nature … then return to the strip to scratch that nagging gambling itch. Another added plus for anyone opting for the overnight stay – the sites are HUGE. Just make sure to arrive early in the day as all sites (about 70 across two campgrounds) fill first-come, first-serve. We arrived early Thursday afternoon to an almost full campground, but did manage to snag a perimeter site with awesome, unobstructed views. By dinner, all sites were taken. Within the park there are a number of easily accessible sights – many being “vehicle tourist friendly” at 0.5 to 1-mile hiking from various parking lots and turnouts. Kelly and I strung together a number of smaller hikes in order to create a few longer 3 and 4 mile hikes. For those interested in as much, there are a few historical sites/attractions to view – some old, others historic. One thing I really appreciated about the park is the variety of colors throughout. My pictures definitely don’t do things fair justice – you will need to witness for yourself. Much of the park is what I imagine Mars to look like, Btw, I’m not alone in that description – many movies have been filmed here – principally due to the unique terrain. At least that is what the Visitor Center literature would have you believe. In fact, fans of Star Trek: Generations (1994) might be interested to know that numerous scenes were filled at the park. In fact, the fight scene where Captain Kirk dies (sorry for the spoiler) was filmed in the area below. Not being a big Sci-Fi type myself, I don’t get too excited about the Trekkie factoids, but I do give this park a big thumbs-up. Probably my favorite hike was the 9-mile (out and back) starting near the Visitor Center, ending at the touristy north end of the park. Kelly, Lilly, and I wandered into this unmarked, non-maintained, mostly empty trail and over a four-hour period encountered only four people. As evidenced within the pictures below, the hike is awesome. Lilly was in heaven scrambling up and down the rock and was completed exhausted afterwards. If you seek two or three days of low-key camping in a mostly un-crowded park, Vally of Fire State Park just may be your ideal place. Note: For those who care … working remotely would be easy here – using my Wilson Sleek for data amplification (connected to the roof antenna), I was able to secure 4G LTE on Verizon. By contrast, AT&T was worthless. Cellular is finicky in the park campground, but when using the Sleek I, secured a good signal sufficient for calls. However, without amplification boost, forget it.